As we learn to trust our nature enough to let go into the present moment with gentleness and precision, our hearts soften, and we appreciate the sacredness of our daily lives. In communicating with the world gently and fearlessly, our awareness sharpens. We discover the open clear sky of mind, a delightful source of wisdom and uplifted energy. 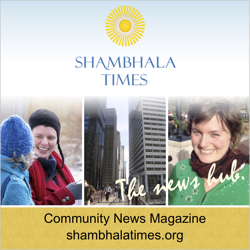 The Way of Shambhala includes Shambhala Training programs I–V, with each training followed by a five-week "In Everyday Life" course that expands upon what was offered in the training. Over the course of a year, these programs introduce the entire Shambhala path. This series offers a glimpse of the Shambhala vision of enlightened society by emphasizing how meditation can impact our daily lives—and from there, how the sanity of meditation can impact our community and our whole society. Wisdom in Everyday Life is recommended either before or after Shambhala Training V. Please click here for a full description of the Way of Shambhala.